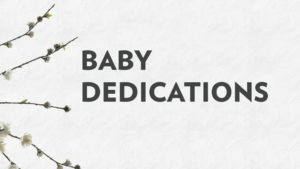 Baby Dedication Sunday is a special time for parents and loved ones to publicly share that they are raising their children to know Jesus. If you would like to dedicate your child during this special service, please use this form to register. Register at this link or contact the church office to sign up at [email protected].